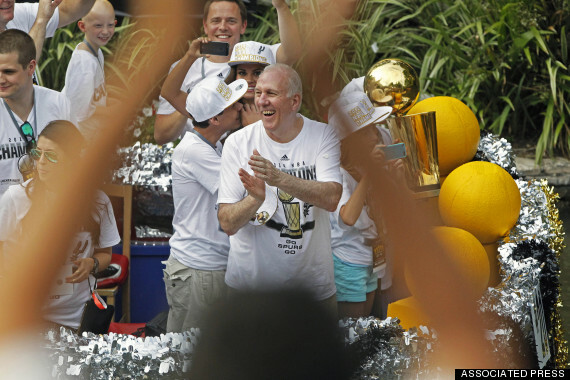 Nobody looked happier than head coach Gregg Popovich during the San Antonio Spurs' championship parade on Wednesday. It was the fifth time Popovich has celebrated an NBA title with thousands of Spurs fans since 1999 and he made sure to remind everyone, perhaps including LeBron James and the Miami Heat, of that as he made his way down River Walk. "We want to thank you mostly for being the greatest fans in the NBA. You supported us really well. Thank you. Thank you. Thank you so much," Popovich said to the fans. "We feel very fortunate to be in this city and to be supported by people like yourselves. And I just want you to know that we're all going to continue to do everything we can to make you proud of us no matter what happens. Thank you for being who you are."